After having taken a step back from the rebel cause after their heroic saving of the day at the Battle of Yavin, Han Solo and his companion Chewbacca have returned to a life of smuggling. After turning down job after job, Princess Leia Organa has made the pair an offer they can’t refuse – a chance to race the Falcon in the esteemed and notorious Dragon Void race as a cover to find a mysterious rebel spy who may have turned traitor. It may be just a cover, but Han’s not going to pass up an opportunity like this one. Against all odds and more notable opposition, he very much intends to win this race, while saving the day in the process. By the end of issue #1 the race has just begun, and issue #2 picks up right where it left off, in the very explosive first leg of the race. Drawing on his hard-earned blue collar experience as a smuggler and his daring wit, Han quickly proves that he knows what he’s doing as he – along with only 3 other racers – make it past the first obstacle of the race. 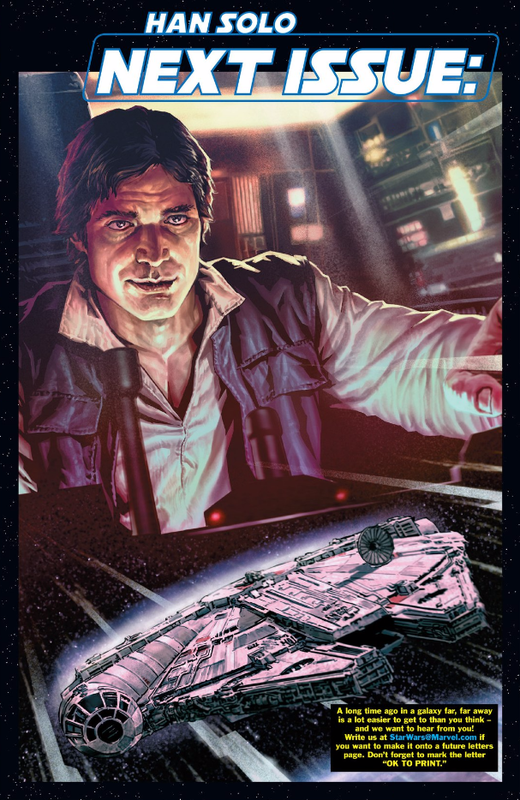 Despite his self-proclaimed fame as the pilot who made the Kessel Run in less than 14, pardon me, 12 parsecs – he is still an unknown among the other more prestigious racers. However, after touching down at their first stop, Han soon realizes that he has been quickly thrust into the spotlight as fans clamor for his autograph. 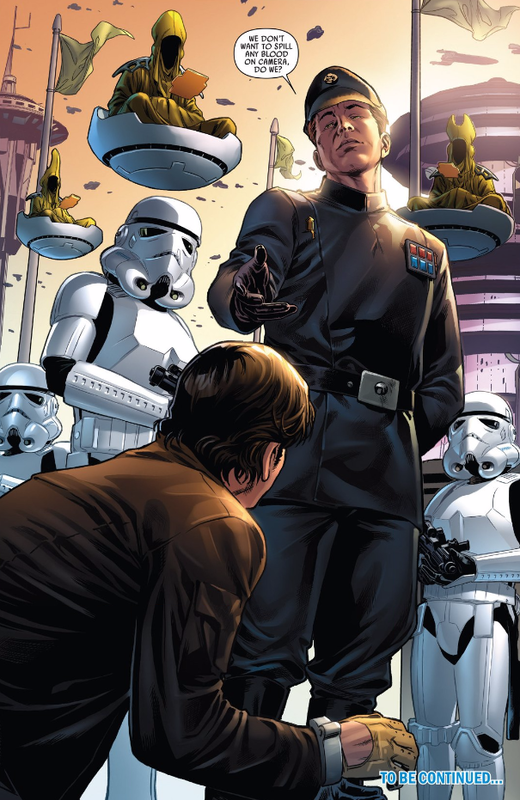 As Chewie goes off to find their rebel contact, Han confronts a fellow racer who deliberately tried to shoot him down during the first run, only to discover that he might have drawn more attention than he intended as Imperial Stormtroopers arrive and arrest all of the racers, inciting outrage in the spectators and racers alike. After an attempt at fleeing Imperial imprisonment , an officer enters the scene and crushes all hope of Han going anywhere anytime soon. 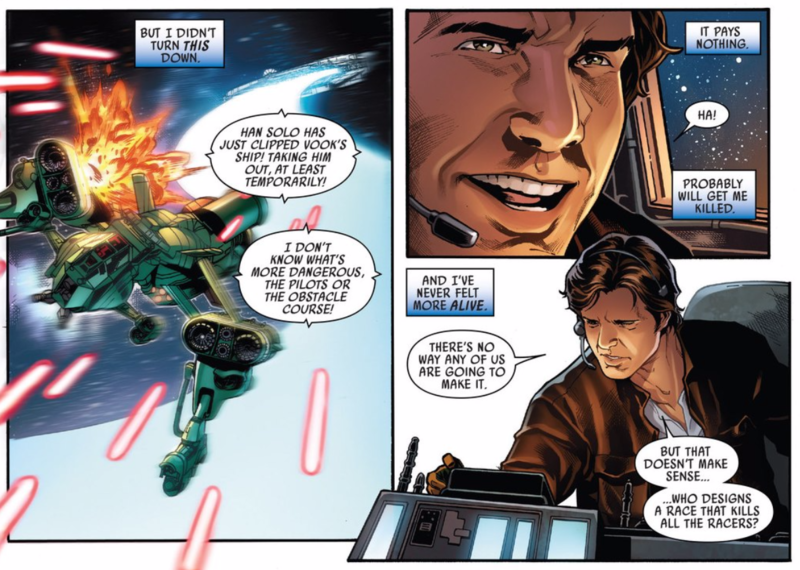 I have to say that I have been pleasantly surprised with the Han Solo series. I found Issue #1 to be very entertaining, and issue #2 has proven that it wasn’t a fluke. 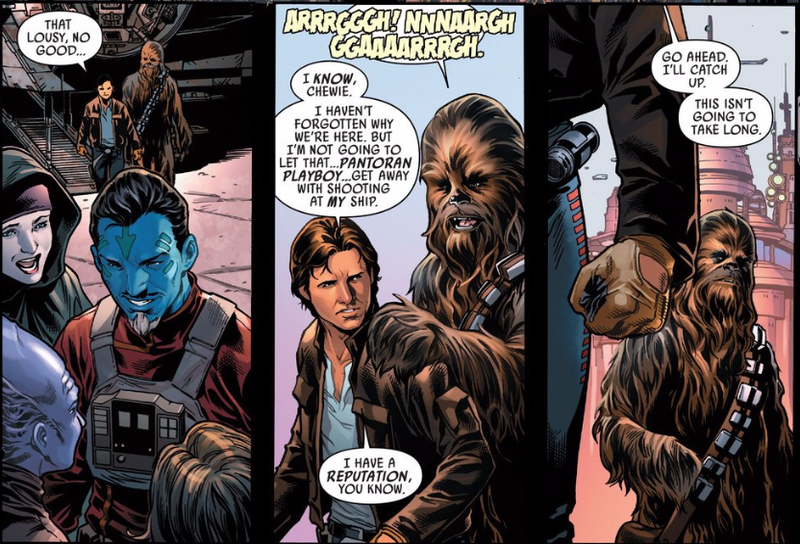 If this trend continues, Han Solo just might be my favorite of Marvel’s five issue character-centric mini-series. 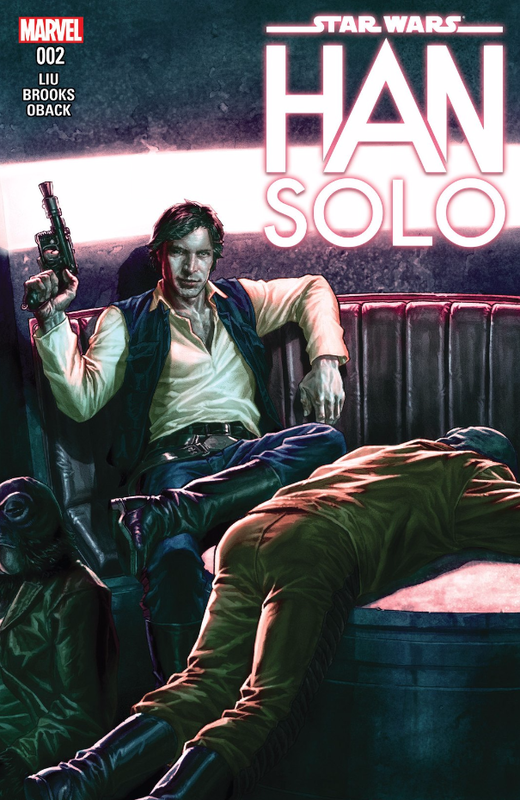 Writer Marjorie Liu, who previously made a decent name for herself at Marvel with her work in the X-23 series, has thus far really captured the essence of Han Solo, giving readers a well-paced story that is both entertaining and rewarding. Coupled with the pencils of Mark Brooks and the brilliant coloring of Sonia Oback, this comic is a feast for the eyes as well. I still hate Bermejo’s cover art in this series, but you know what they say about judging a book by its cover . 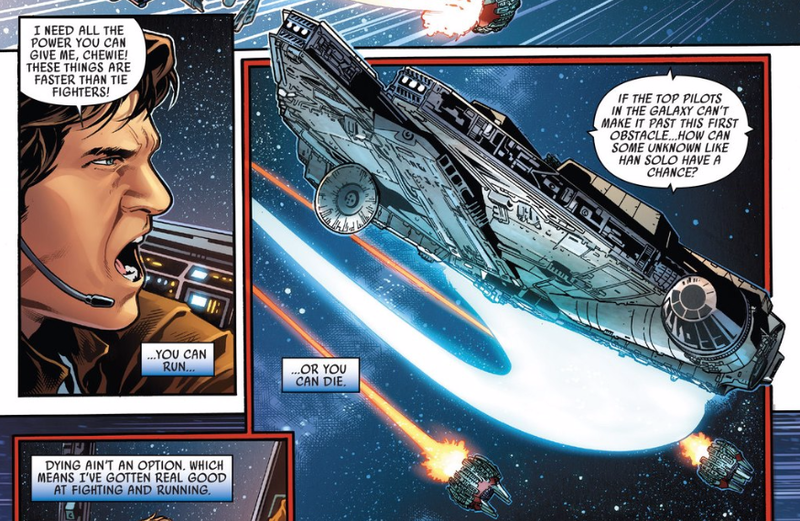 Brooks more than makes up for it with his fantastic pencil work, so as Han would say, “She may not look like much, but she’s got it where it counts, kid.” Do yourself a favor and check out this series if you haven’t already.